this is a blog called geometricsleep. : Shoes, shoes, everywere shoes. Urban Outfitters keeps KILLING it with their merch! 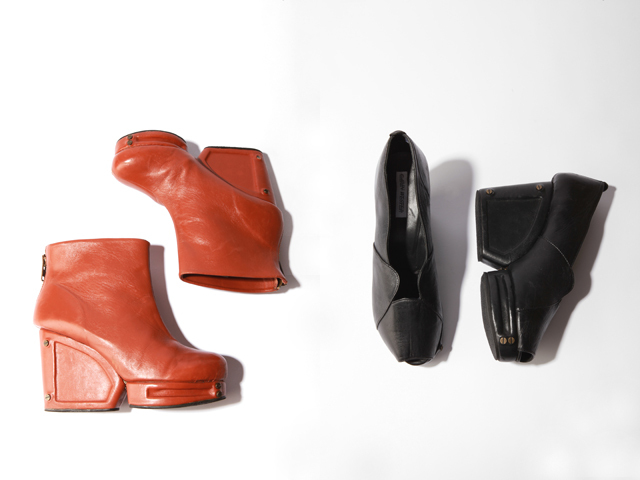 How awesome are these Carin Wester booties? VERY AWESOME is the answer. Not so awesome? Their price. At $364 to $429 they cost the same price as a lot of awesome shoes out there so it's not like OMG RUN AND GET THEM! But if you've got it, I say drop it. Edit: At first I thought this was a collab, but it's not! In any case, it's totally weird that Urban is upping their price range like that. Quite possibly the most stylish boots we have ever seen! saw these too- so awesome. if i had the dough i'd definitely get em, but the IF is always the issue..
Holy crap! the black ones are so awesome. Maybe urban is following the format of it UK counterpart? They sell Carin Wester and more expensive brands like Karen Walker too. I too have noticed that they have stepped their game waaaaay up lately. They have this amazing Stine Goya sweater that I want, but it's around $400 which is so weird for Urban.